I have read so many US interviews experiences in Mumbai Consulate about 221g and Visa Rejections after a long wait. There were 2 officers wearing suit had arranged all the people according to their visa category in line. Then we had told to be prepared with our I-20 and passport only in our hand. Then we had taken to the first building for security checkup. F1 Visa Administrative Processing – Why do they issue 221g? Me: For perusing my PhD degree. VO: You have done your masters? VO: When did you have finished your masters? VO: What were you doing till now? VO: Which University you are going to? VO: Did this professor have talked to you? VO: Who is funding you? VO: Everything is OK but for administrative purpose please submit this documents via email. She had given me my passport, I20 and Green 221(g) slip containing list of documents that I need to email with detailed procedure I need to follow for doing this to track the 221(g) status. I had emailed the documents on 11th June. My case status was updated on 27th June (16 days of 221g Processing). Submitted my passport at nearest VAC on 28th June. Administrative Processing is just an added step in the visa interview process. 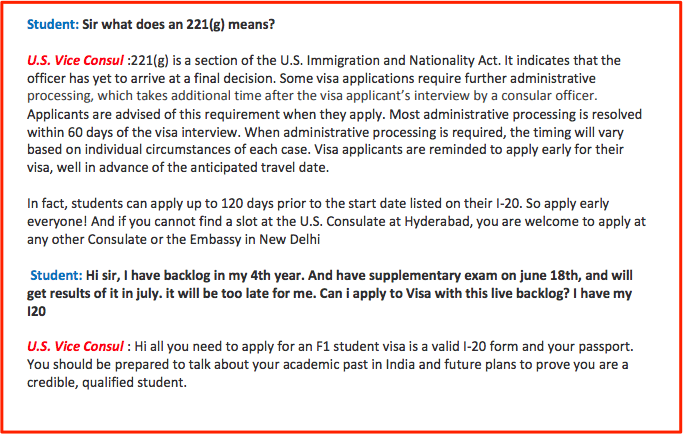 We can’t really tell, what triggers 221(g) process and why it takes several days for Visa approval. Always, plan to attend the visa interview at the earliest and that’s true if you may fall under TAL List. interview date 19 march 2019 for f2 dependant visa. the consular asked me some questions then wrote something from my I 20 to his computer finally he holds my passport(my passport is in the hands of the consular “and gives me 221 (g) says”Admin processing -will be contacted for further instructions /notification of visa pick up / so please share me your ideas what does mean. i had gone my visa appearance yesterday, i was happy because it was approved by the consulate then a minute after she called my name she gave me a green form of 221g. and told me that i need to send an updated date of my training program together with my passport. im so worried. what would be happen next????? I received a green slip after my interview two days back. I am asked to submit additional documents. But, my status has been Refused in the online status check from the date of interview. It was last updated on interview date itself. Is it common for the status to be shown as Refused during this period? Please help. Jan.13 2017 my status changed to issued. my name is Johar Abdulwehab Zuber from Ethiopia.i have been interviewed August 24 2016. the consular asked me some questions then wrote something from my I 20 to his computer finally he holds my passport(my passport is in the hands of the consular “and gives me 221 (g) says”Admin processing -will be contacted for further instructions /notification of visa pick up / so please share me your ideas what does it mean. Please mention Year of the interview. hi, i might be late but I have encountered the same case, what is your department? Even I have received the green slip! Can you please mail me rough drafts or formats for the docs. required! Hello, ev1 I have received 221(g) green slip!! Please help me as to how should I draft the required documents..
hi. I know this is a late question. But what documents were you required to submit for 221g? i well be there next year. though she shivered u , at last u won , congrats bro……………………..